Culdcept Saga is the first next-generation release of the franchise that also claims games on Sony’s Playstation 1 and 2 and Sega’s Saturn and Dreamcast. Released in 2008 (North America release; Japanese release was in 2006) by developers OmiyaSoft and Jamsworks and publisher Namco Bandai, Culdcept is an intriguing marriage of board games and collectible card games. Being a fan of both Monopoly and Magic: The Gathering, I had to give it a try. After having a bit of fun with the demo, I found a used copy and snatched it up when I reserved Arkham Asylum. While obviously catering to board game and CCG players, Culdcept is fairly intuitive to new players from the beginning. Traveling princess Faustina finds our character and leads him through a storyline that is laid out between and behind boards in the manner that certain XBLA games (think Puzzle Quest) seem to do. This allows the card/board game to grab the attention at the forefront while splashing a little flavor in the background. Faustina gives little tips about the more intricate details of gameplay both before the match and during your initial rolls on each board while loading screens fill in with illuminating plotline and/or strategy tips. While this hands-on, learn-as-you-go instruction is a boon to new players, Faustina’s tips that come later in the game seem a bit too late, informing the new Cepter (the card-wielders) after the fact about techniques that have already appeared in previous matches. The bread and butter is that you have a modifiable 50 card deck that you carry with you throughout the game. You can save a number of different modifications to this deck, and cards you win by placing first, second, or third will surely find their way into and out of this one active deck that is your “weapon”. Out of the almost 500 different cards that there are in the game, you must sort through your acquired spells, items, and creatures in order to maximize your efficiency against the decks of various enemies. Like Monopoly, you roll and progress around a board, claiming spaces in order to gather toll, which results in a payment of magic, the currency in this game. In order to claim these spaces/lands, however, you must summon monsters to hold them. Monsters are typically elementally aligned, as are the spaces, and get defensive benefits for matching with proper lands, and offensive benefits for being placed adjacent to other lands occupied by your creatures. You will get bonuses (akin to passing Go in Monopoly) by passing Forts and the Castle. If you land on these aforementioned spaces you can manipulate any one of your claimed lands, utilizing unique creature abilities, raising the levels of the lands to increase toll and the value of the elemental chains (built by accumulating more than one of a certain type of land in a certain area of the board), moving your monsters to neighboring lands, or changing the terrain to a more beneficial land. In order to win the game you must obtain the target number in total Magic and return to the Castle first. The visuals and audio of the game are nothing to write home about. The graphics are minimal as this is a game where the biggest trial aside from occasional cutscenes is displaying quasi-3D avatars walking around a board populated by barely moving quasi-3D monsters. The audio is basic enough to not make you want to jump off of a bridge while listening to it on loop for matches that often last hours. There is voice acting during the cutscenes, but this isn’t a sparkly one, folks. 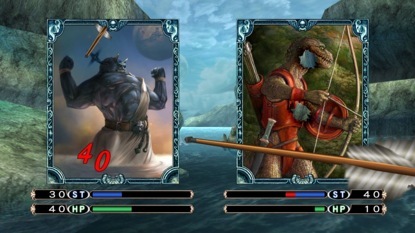 Culdcept Saga bears its own set of X-Box Achievements, as any other game, but it also has a unique set of requirements that can be met by playing strategically during your matches. Rewards for meeting these goals rewards the player with accessories such as weapons and armor that may be equipped to your avatar to change your in-game appearance. While this has no significance beyond cosmetics, it provides a little more variety to Culdcept Saga, allowing perfectionists and collectors to chase a few more trophies. 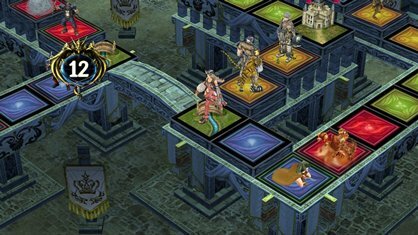 While not as bountiful as other genres’ games, Culdcept boasts a single-player Story mode as well as multiplayer mode to cater to both online matchups and local versus mode. Since I have a long history of fervent playing of similar games, Culdcept Saga greatly appealed to me. That said, I believe that the game is restricted to this small demographic, as matches can and do at times last for hours. If you are behind, it can be downright agonizing, as playing against multiple AI on certain boards can nullify your best efforts at throwing the game. I restarted the game a few times at predetermined points during a suspended game after my roll and my opponent’s roll had worked out against me (so sue me!) and found that our rolls were the exact same. Now as this “convenient fluke” recurred in my repeated tests, I am led to believe that the randomization suggested by the die roll perhaps is actually predetermined. While this may not miff some, it was a bit of a turnoff for me. Note that this only occurred when I resumed from a Suspended game. At certain points you are not allowed to check the map (mid roll, halted at a tower, etc.) which is great for tripping up players, but not so much when you play against multiple AI characters who know the board. You can only Suspend the game (a feature that allows you to take up where you left off) at the top of your turn. An oddity is that players are able to see each others’ hands when it’s that person’s turn. While this helps to a degree, it takes away from the element of surprise, particularly during player vs. player matches. For all the rants, the game is addictive for those players who fit into the little niche that this game beckons. Yes, oftentimes matches take hours, but I found myself coming back to the game, even after I’ve cursed it for losses that surely were chalked up by good ol’ AI cheating. Everyone gets cards at the end of the matches. This “parting gift” is both a small consolation for your efforts as well as an augmentation for your card collection. You might have to lose a couple times in order to be rewarded with the right card or cards that will spell out the defeat of your foe. And it’s a sweet victory indeed when you come back for successful revenge with some cards that your opponent surely laughed about when handing them to you after your defeat. Ticomun. This NPC is cuddly one second and homicidal the next. You may hate him during his first match, when he is probably at his best and you are at your worst, but his one-liners are often quite amusing in a “did that little thing just threaten to eat my brains?” sort of way. Since this is a marriage of card games and board games, it’s got decent replay value. There is a good library of cards, which means that there are a plethora of different deck combinations, not to mention the effects of the variable boards. While the player base may not be as strong as it used to be, thus lowering the array of players to meet up with for some versus matches, if you make a few friends who love Culdcept then the game definitely pays for itself. Culdcept Saga is definitely worth checking out if you’re a fan of either Monopoly or Magic: The Gathering. If you’re the impatient sort, however, do not bother, as you will be spending HOURS on certain matches. Unless you’re after the achievements, it’s not really worth renting this one…the real value is in making different decks and trying them all out against (preferably real) opponents. My advice? Keep food, water, and migraine medicine handy…even if you fit into the target audience, there are times you will go into a swearing frenzy. ← Ermahgerd! Good Xbox deals from microsoftstore.com! !